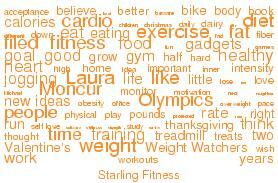 It looks like adults are joining organized sports leagues and specialty classes in droves right now. The idea of joining a gym in order to play dodgeball or kickball is outlandish to me. Those two games were the bane of my grade school existence. On the other hand, I had a truly enjoyable time with my softball experience last year. I like the idea that adults are getting themselves off the sidelines. Instead of putting all their hopes on their children, they are playing for themselves. This is REALLY healthy, both physically and emotionally. Yesterday, I wrote about my miserable experience at 24 Hour Fitness with the other patrons of my gym. I made the decision to find a home gym that I could work with. Mike and I used to have a home gym when we lived in the suburbs and had 3500 square feet at our disposal, but now, we live in the city with only 873 square feet and a six-foot basement. We decided to go shopping for a home gym that would work for us so that I didn’t have to clean up the disgusting bodily fluids of strangers at the gym. My sister and her husband have a “flex” machine that he loves, but she hates, so I was attracted to the Bowflex machines. There are two problems with those machines, however, they are EXPENSIVE and they stand seven feet tall, which makes them useless for us because they wouldn’t fit in our basement. Neither Mike nor I wanted to make a weight machine the focus of our small house. We already have my bike trainer set up in the living room. Somehow we can live with that, but adding a Bowflex would overpower our decor. I was attracted to the Bowflex because it wouldn’t weigh a ton of weight, I could fold it up small and it had a bunch of exercises that I could do. It didn’t fit. In fact, we were hard pressed to find any machine that would fit in our basement because many of them have the lat pulldown so high that it’s impossible for it to fit under the floor joists in our basement. We did find one machine from Nordictrack (FreeMotion) that would have easily fit in our basement, but we weren’t willing to spend $2500 on a home gym. At that rate, we could pay for over four years of club dues for both of us before we would make up the money spent on that one machine. There was no way we were going to spend that kind of money on a home gym, especially one that heavy. After looking at all the home gyms, we came to the conclusion that we would do better to buy a weight bench and some free weights. I am the kind of person that wants the world, so I wanted a weight bench that would have a wide variety of exercises (leg extension, leg curl, preacher curl, lat pulldown and something for the pecs). I had seen a beat up bench that could do all those things at the local thrift store. I wanted a brand new one. I was willing to give up the lat pulldown because of the height of our basement, but I wanted everything else. Guess what, I found it! When I saw this bench at Play It Again Sports, I immediately took out my measuring tape and took the stats. Mike and I had been to over eight stores in the Salt Lake Valley and Mike had given up and gone home. I was still searching and when the height of the bench (including the lat tower) came in at six foot-one inch, I knew I had found the weight bench for us. The foot print is less than 3 foot by 4 foot, but it actually takes up more space (about 5 foot by 5 1/2 foot). I knew when I reeled in my tape measure, it would fit in our basement as long as I positioned the lat tower between the floor joists. You can’t see it, but this bench also has a preacher curl attachment that fits where the lat tower is currently attached. It also has leg extension, leg curl and a pec deck (those curved handles on the side). 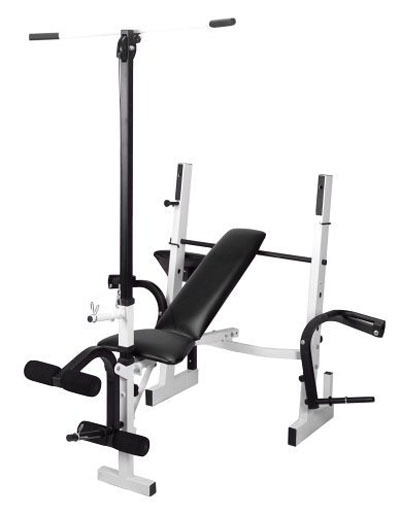 I could build my pecs without doing a bench press alone, so I really liked this machine. It cost us $110, plus 80 bucks for a beginner set of weights. In a month, I will give you another update on my home weight training. For now, I’m just excited to go downstairs and workout. Let’s see if I get the same results as the gym. I am completely shocked that Amazon sells the weight bench that I bought, but there it is: the Apex Adjustable Weight Bench. At Amazon, it costs $129, which is twenty bucks more than I paid at my local store and that doesn’t count shipping, yet it’s there. You’ll probably have better luck at a local sporting goods store, however. I’m still reeling from the fact that I got a complete home gym for under 200 bucks. That’s four months of gym membership dues. I will have paid for it four months after I quit 24 Hour Fitness. Amazing! The Diet Blog analyzes a diet article that essentially deifies food and compares eating choices with sinning. I grew up with this sort of eating mentality and it wasn’t until I released these thoughts that I was able to lose weight the healthy way. Next time you feel like you’ve “sinned” and you need to “repent”, remember that this is about living a healthy life, not about being “good”. You are already a good person, you just didn’t plan your eating very well. Do better next time. Weight training initially slows weight loss: Even though I have been eating very healthy the last month, I have only lost two pounds (as opposed to my usual pound a week when I’m eating healthy). I am toning up: Even though I’ve only lost two pounds, I am toning up. My clothing is fitting better, so I KNOW that I am losing fat. It’s just not showing up on the scale yet. This is hard for me to face when I have to weigh once a week, but it’s great when I pull on my jeans. Gyms are full of gross, sweaty people: 24 Hour Fitness has a rule that you’re supposed to carry around a towel and clean up after your own sweat, but it is NOT enforced at my gym. I end up using my towel to clean up the sweat of dripping wet, gross people. Gym ettiquette is non-existent: People crash down weights, grunt and scream and sit like zombies on the circuit (Xpress Zone) machines. I’ve even had the 24 Hour Fitness personal trainers sit their clients at the circuit machines and have them do their exercises, talking to them while they rest between sets. I love weight training, but I HATE the gym. Tune in tomorrow to see what I decided to do to keep up with my weight training without having to wipe up the sweat of other people. Cheryl Koch, R.D. talks about the things that her mother used to tell her when she was little. Does all that advice hold any water in this day and age? See her article for the full story behind these things that your mother told you. A study at BYU found that Utah Mormons weigh 4.6 pounds more than Utah Non-Mormons. Ironically, this is great news, because ten years ago, Utah Mormons used to weigh 5.7 pounds more than Utah Non-Mormons. So much of my experience with growing up was blaming things on the Mormons. We have huge ice cream parlors here dedicated to decadent treats. I used to blame this on Mormons until I heard about Ben and Jerry’s. I don’t think there are enough Mormons in Vermont to have started that craze. I remember seeing a editorial cartoon in the Salt Lake Tribune where a fat Mormon woman with a huge ice cream sundae was scolding a thin woman who was smoking. She said, “You’re just praying for a heart attack.” I remember laughing at that cartoon blaming the Mormons for their judgemental behavior when I was doing just as much judging myself. The problem that I have with this study is that they are comparing the weights of Mormons to Non-Mormons. We’re all human. We all have the same access to the same restaurants in the state. Why are they comparing us? If the study had turned out the other way, I wonder what headlines would be announced on the local news. “Word of Wisdom Protects The Faithful” is what comes to my mind. All of these recommendations came before the Food Pyramid and the research about tobacco related deaths. Whether you believe these recommendations came because of divine inspiration or because it’s more economical to feed the minions on grain than it is on beef is a discussion for the Theology wing, but the truth of the matter is, the Word of Wisdom SHOULD be making the members of the LDS church thinner than their Non-Mormon counterparts. Why aren’t they? You need to go to the closest store right now and pick up the March issue of Self Magazine. Right at the top of the magazine, they have the story, “Wow! Shrink a Size Naturally” advertised. It’s on page 156 and I nearly missed it. Hidden after the makeup and the clothing, I almost ignored this article. My attention span for women’s magazines is less than a full magazine, so I am so glad I didn’t pass this one by. 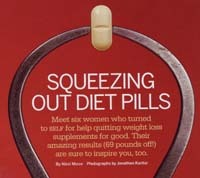 Self Magazine convinced six women to give up their favorite over-the-counter diet pills and try exercise and healthy eating. The called their article, “Squeezing Out Diet Pills” and the results these women saw were phenomenal. They threw away their Zantrex-3, Total Lean-Control, Trimspa, Suvaril, Metabolife, Metabolife Ultra Caffeine Free, and Cortislim in favor of eating and exercising according to the Self Challenge. One of the six women gained 1 pound of muscle, but the rest lost between 8 and 20 pounds where their diet pills had done nothing before. Next time you think about throwing your money away on these diet pills, remember that simple eating and exercise can give you far better results. They want to sell you a t-shirt, but you don’t need to buy one if you just want to see your weblog in words. I found this comic from The Boondocks funny last Sunday. It reminds me of my entry about Cookie Monster on Sesame Street telling kids that cookies are only a sometimes food. I guess that was like David Crosby on those “Say No To Drugs” commercials. 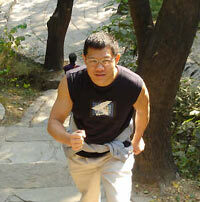 When forty-six year old Yang Guangwen decided to ride his bicycle around the world all by himself, he was hoping to do it to promote the Olympics in 2008. He said nothing of the training that he has been doing so he can accomplish this feat, but China Daily was able to find out how hard he’s working out. Financially, he had sold off some of his business to amass the funds, while physically, he is keeping fit by cycling 30 kilometers and swimming 2,000 meters each day. He has plans to visit the cities who have hosted the Olympics in honor of Being’s 2008 Olympic hosting. I have fantasies about traveling around Europe on a bike, but this takes bicycle touring to a new level. When I am riding on my bicycle, the whole world is smaller and I see things that I wouldn’t have seen rushing by in a car. That’s why travel like that is appealing to me. That said, I have ridden in a car along I-80 and the strip from Wendover to Reno is an empty expanse of life-endangering heat in the summer and cold in the winter. I’m sure the rest of the world has its own expanses of desolation. It doesn’t say in the article whether he will come through Salt Lake City, but if he does, I’ll be there, cheering him on!